If you live in Louisiana, your primary objective in raising a home is likely to be flood avoidance, even if you're not in an identified flood hazard area. Elevation is the most effective on-site method of reducing future flood damage. New buildings in designated flood hazard areas must have the lowest floor at or above the elevation of the base flood, the Base Flood Elevation (BFE). Elevation is required when a building has been substantially damaged or is being substantially improved. If the improvement is an addition of a room on the side, the addition - and sometimes the entire structure - must meet the requirements imposed on new construction. Substantial means the cost of improvements (or repairs) as a percentage of the market value of the structure before improvement (or before damage) exceeds some threshold value. The maximum threshold value allowed by FEMA is 50%; in some Louisiana communities' local governments have lowered the threshold to 40% or even 25%.If substantial improvement is not tracked cumulatively, the structure can be improved 40% this year, 30% next year, and so on - without triggering the substantial improvement provisions. If it is tracked cumulatively, the 30% improvement after a 40% improvement would exceed 50% and trigger the requirement to elevate. When the objective is to get the home's lowest floor higher, the first decision may be whether to elevate the building or tear it down and build a new one that has the floor at the desired height. The building must be examined to determine whether it will survive the elevation process. The owner to choose demolition and reconstruction, rather than elevating the existing structure. This decision may be influenced by rules that apply to grants or loans used to fund the project. A complete elevation project includes design and drafting, preliminary site work, the actual lifting, rehabilitating the building with stairs, porches and decks, possibly altering the roof, repairing walks and driveways, and landscaping. If the building is being lifted, the elevation contractor should have control of the job from the time the house has been prepared for lifting until it has been set on its new foundation. If the new foundation and supports are to be built by subcontractors, the elevation contractor, not the homeowner, should subcontract that work. This arrangement allows the elevation contractor to assume complete responsibility for the structural integrity of the elevated structure. If your primary objective is to avoid flood damage-the higher you go the better. But, there are practical limits to elevation. The higher a building is raised, the greater the wind-load it transfers to the foundation. Raising a structure does not remove it from the Special Flood Hazard Area (SFHA); therefore, it does not exempt the owner or the mortgage holder from flood insurance mandates. There are flood insurance advantages for exceeding the minimum elevation requirements. The flood insurance savings associated with higher elevation may be offset by higher insurance premiums for wind and fire coverage, or loss of coverage through private insurers. 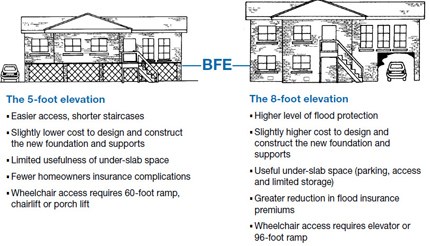 There may be things you can do with the elevated foundation to reduce the impact of elevation on homeowner's coverage. The most common standard used for flood protection is the Base Flood Elevation (BFE) - the level of the base flood or the 100-year flood. After a disaster, FEMA may provide advisory elevation guidance, producing Advisory BFEs (ABFEs). Communities are encouraged to adopt the ABFEs for regulating development while new Flood Insurance Rate Maps (FIRMs) are being developed. If the home is in an area for which there is a man-made drainage system, it should be built higher than the inlet for the drainage system. When an area has flooded to a depth higher than the BFE or ABFE, the height of that flood can be a better reference standard than the BFE or ABFE for avoiding future flood damage. A home that is protected from a flood source by a levee will enjoy the best protection if the lowest floor is above the height of the levee. If not elevated to that height, elevating 3-5 feet off the ground provides a higher degree of protection against levee overtopping or problems. The BFEs do not take into account subsidence, sea-level rise, coastal land loss or development in the watershed, which will potentially increase future flood depths. In an effort to encourage better protection, many Louisiana communities require freeboard - building one or more feet above the BFE. Buildings on piers or posts have been designed to be supported at identified load-bearing points that are accessible from above ground. They are not typically constructed with brick veneer, stone or concrete blocks and do not usually have fireplaces and other hard-to-lift components. Three basic techniques have been used successfully to elevate buildings that are built on slabs: the slab, walls and roof can be lifted as a unit; the walls and roof can be lifted, leaving the slab on the ground; or, the roof can be removed, a second story added and the roof replaced. By careful excavation and support, beams can be placed under the slab and lifted using a unified hydraulic system. This method is non-intrusive, but can be very disruptive to the landscape. When the home is removed from the slab, a temporary support system is constructed within the building. This support system keeps the building rigid and provides the surface base for lifting. Once the building is lifted, a new floor structure and foundation are constructed. It may be possible to build the new supports on the old slab. This procedure is used most often after a house has flooded and the walls are opened. With some types of construction, the "elevation" can be achieved by removing the roof, building a new first floor, extending the walls and replacing the roof. What was once the living area is wet-flood proofed and abandoned, except for parking, limited storage and access to the new living area? Depending on the condition of the roof and the capability of the contractor, it may be possible to reuse the original roof structure. Building codes and flood damage prevention ordinances impose requirements on foundations in A and V zones. In all special flood hazard areas (SFHAs), the building must be designed, constructed and anchored to prevent flotation, collapse and lateral movement. Space below the Base Flood Elevation can be used only for access, parking and limited storage. Materials used below the Base Flood Elevation must be flood-resistant. Raising the home on compacted fill or driving pilings are good options for new construction, but their use is difficult when an existing home is being elevated in place. The best options will be a chain wall or concrete columns foundation. In V zones the foundation must be designed and certified by an engineer. It must be open above grade and deep enough that it will not be undermined by scour. The area below the raised floor must be free of obstructions, but may have breakaway walls, lattice work, slat work or screening. Foundation walls are not allowed in V zones. Masonry block walls are often used as a foundation for raised floors. There are some rules for enclosed spaces below BFE in flood zones and some principles of good practice that will help reduce mold and indoor air problems. Masonry foundation walls must be reinforced with rebar and have the cells filled with concrete. The floor of the area enclosed by the foundation wall-should be at a higher level than the ground outside the wall, so water does not collect under the home. It should be covered with a slab or with a sheet-type moisture barrier. The space can be fully enclosed and conditioned only if approved engineered openings are used to allow automatic entry and exit of flood water. Support is required under the interior load-bearing walls. Interior support can be provided by additional masonry walls, masonry columns, or steel poles. Attachment of the raised home to the foundation wall is critical. This wall-to-foundation connection is required to prevent floatation and to withstand the shear and uplift forces of wind. Uplift and shear forces are often overcome by using metal straps, anchors and clips. Over time, concrete-filled masonry develops cracks and crevices that can allow termites to move undetected from ground to building. Great care must be taken to add termite barriers in the soil and at the juncture between foundation wall and wood framing. A good alternative for an elevated home's foundation is concrete columns on a grade beam base. 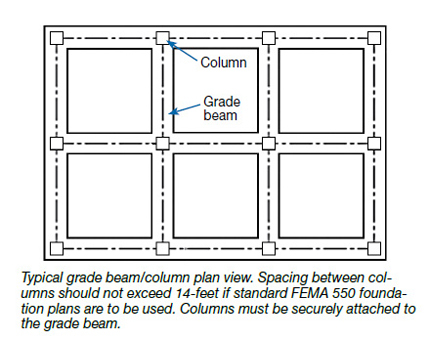 Columns on a grade beam are appropriate in a zone, including A zones near the coast, as long as the potential for waves and scour is low. Stacked concrete blocks-even when filled with rebar and concrete-must be tied to a steel-reinforced grade beam if they are to resist uplift and horizontal wind and water forces on the structure. 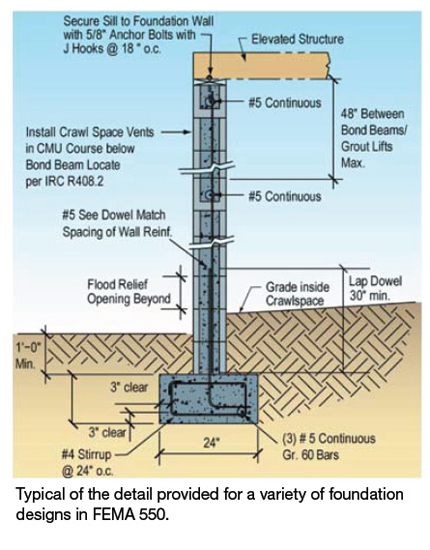 In coastal Louisiana soils, where soils have limited bearing capacity, grade beams should be used under all columns, posts and piers to provide uniform load bearing capacity and add rigidity. 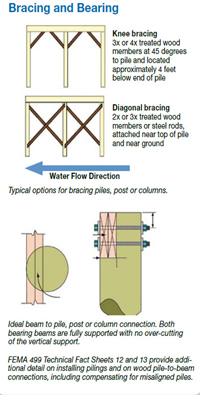 Driven pilings can be used for above-grade support if the raised house is moved aside and brought back. Most structural movers have the ability to do this. Pilings may be round or square and can be treated timbers, steel or reinforced concrete. Driven, long pilings are usually the best option if the structure is to be elevated more than 10 to 12 feet above the ground. 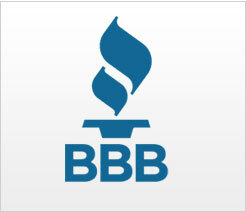 On treated wood pilings, select treatment chemicals that resist termites and decay. Inspect and treat areas around pilings as recommended. Elevation is almost always subject to regulation. Check with the local permit department. If you are remodeling and the work is exempt from building codes, a permit is still required for construction and remodeling if the building is in a designated flood hazard area (A or V zone). When a raised wood floor is to be insulated, it must be done with consideration of climate. In an air-conditioned home, water will condense from the warm/humid air in the crawlspace onto the subfloor and joists. The method used should reduce the potential for trapping this moisture in the floor framing. Many people are reluctant to elevate an existing home because they can't imagine how it will look. The cost of stairs, decks, ramps and elevators cannot be overlooked. Also consideration should be given to whether these access features will be open or under roof. 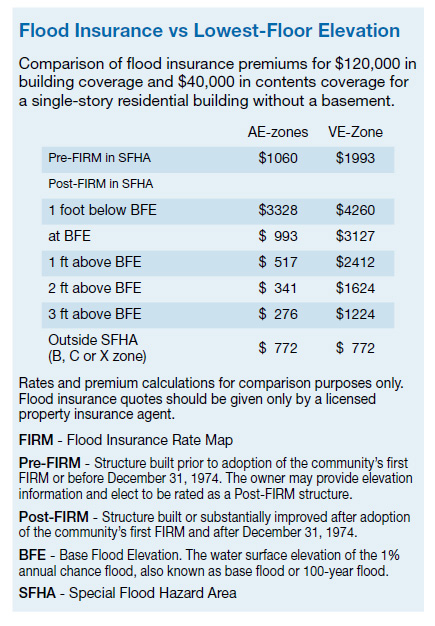 FEMA's May 2008 publication P 467-2, "Floodplain Management Bulletin: Historic Structures" addresses how the National Flood Insurance Program (NFIP) treats historic structures. Financial assistance that may be available to communities and individuals for flood damage reduction, either from the national floods insurance Program or from federal sources, can be used to elevate and/or relocate structures. Congress has authorized several programs for reducing damage in future disasters. If you have flood insurance from the National Flood Insurance Program, and if you are required to elevate as the result of flood damage, you can obtain funds for meeting the elevation requirement by filing a claim for Coverage D - Increased Cost of Compliance (ICC). Coverage D has a maximum benefit of $30,000. In 2004, Congress authorized a change in Coverage D that would make it available for claim when the policyholder is receiving grant assistance for mitigation. Check with your property insurance agent for more information about this coverage of the NFIP and your eligibility to file a claim for it. In the post-disaster, recovery environment, additional federal programs can provide assistance for elevation. These include FEMA's Hazard Mitigation Grant Program, the Small Business Administration disaster program and specially authorized funds, such as the Community Development Block Grant funds through which Louisiana's Road Home program provided elevation incentive grants to individuals.